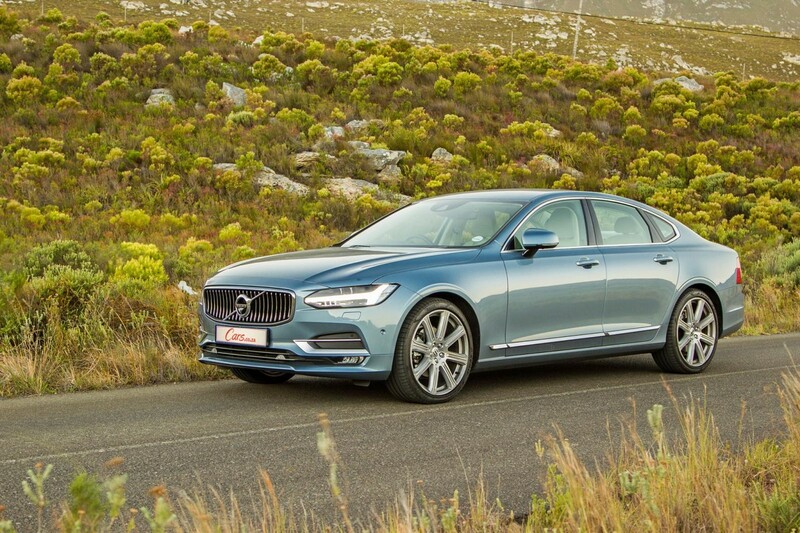 As the follow-up to the 2-time Cars.co.za Consumer Award-winning XC90 SUV, much is expected of Volvo's S90 executive sedan. 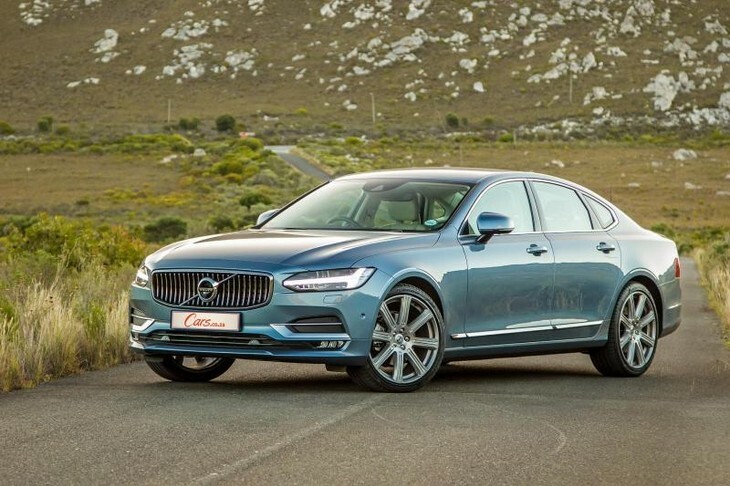 In a market that was recently enlivened by the arrival of the new BMW 5 Series and features the acclaimed Mercedes-Benz E-Class and Jaguar XF, the S90 is the finest Volvo sedan in many a year, if not ever. We don’t like: Some options are oddly priced (R4k for Android Auto/Apple CarPlay! ), other than that, it is hard to fault this impressive offering. The new kid on the block: BMW 5-Series. The all-new BMW 5 has arrived in South Africa, but unfortunately, it wasn't available for an immediate head-to-head with the Swede. Like most BMW products, it promises sporty driving dynamics coupled with semi-autonomous technology lifted straight from the 7-Series. Refinement and technology galore: Mercedes-Benz E-Class. The big E-Class offers excellent refinement and technology, although it looks a lot like the C-Class. Visual transgression aside, it's a formidable offering. For someone who likes performance: Jaguar XF. 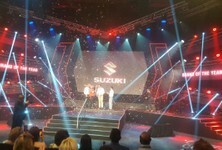 The Cars.co.za Consumer Awards winner offers something sportier than anything else in this segment, but we feel that its engine is a bit old and unrefined in comparison. It lacks the gadgets and features of the Volvo. The S90's exterior design has been widely praised, it strikes a good balance between elegance and overt luxuriousness. Appreciation for the S90's distinct tail light clusters has not been as universal as its front visage. The engine truly comes on song around the 2 000 rpm mark and any lethargy at takeoff is soon forgotten as the D5 delivers effortless in-gear surge. Volvo says it'll do 0-100 kph in 7 seconds, but attempting to recreate this results in the engine sounding a mite strained atop the rev range. 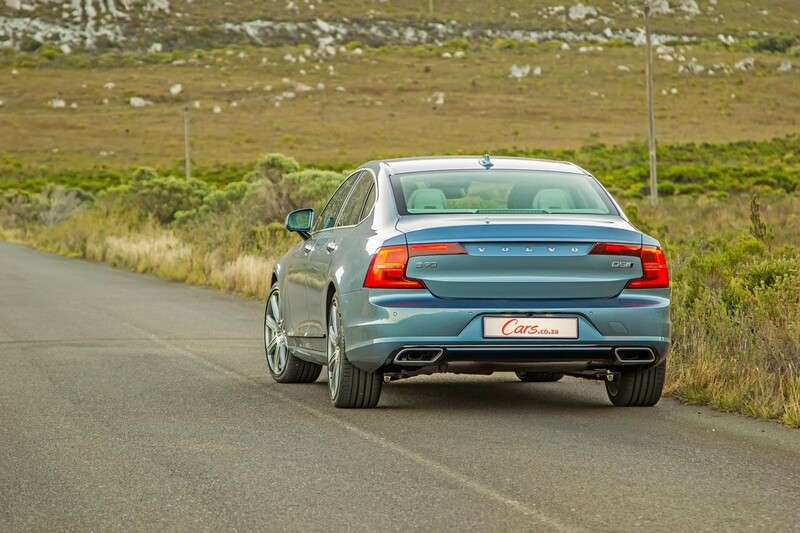 All four wheels are driven via an 8-speed automatic gearbox and while Volvo claims its diesel-powered S90 will sip 4.8 L/100 km on the combined cycle, we could only manage mid-7s and put it down to the small engine working hard to keep the big sedan moving. Rich and inviting light leather in combination with expanses of wood trim and brushed metal inserts was lauded by the test team. The Volvo S90's cabin is an eminently tasteful and comfortable place to occupy. This particular D5 Inscription derivative came with a rich lightly coloured leather upholstery blended beautifully with wood panels. Practical concerns aside, It looked like it was lifted straight from Ikea's Scandinavian Collection. It's gorgeous, both to look at and to touch. 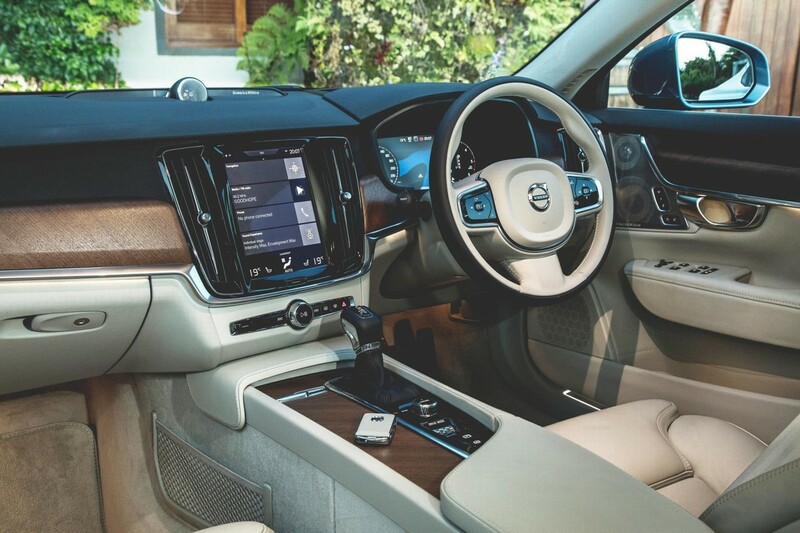 The centrepiece of the cabin is Volvo's iPad-like Sensus infotainment system, which takes everything you know about in-car entertainment and features control and turns it on its head. Not only is it slick in operation, but the user-friendliness is hard to match. No fancy graphics or cascades of colour here, just a pure, clean user experience. Can you get more Swedish and minimalist? The digital instrument cluster is slick-looking too, and our particular test unit came fitted with the R65 000 Premium Pack (one of the options well worth considering), which includes items such as a superb Bowers & Wilkins audio system, heated seats, keyless access and some additional safety features. The available space is excellent; rear legroom is to be commended. It is palpably apparent that Volvo is determined to woo potential customers with a bedazzling array of safety features and modern technology. 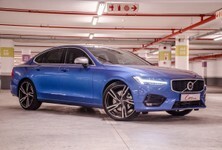 This S90 features Pilot Assist, which, according to the firm, "is a semi-autonomous driving assistance system. The system manages acceleration, braking and steering at speeds of up to 130 kph." We just had to put it to the test and it's initially quite disconcerting to trust the car to not drift out of its lane or drive straight into the person in front of you. While it's strictly an assistance system and doesn't replace the driver, the team feels that it's only going to take a software update and the car will be capable of a lot more. The best use for this tech is in bumper to bumper traffic. 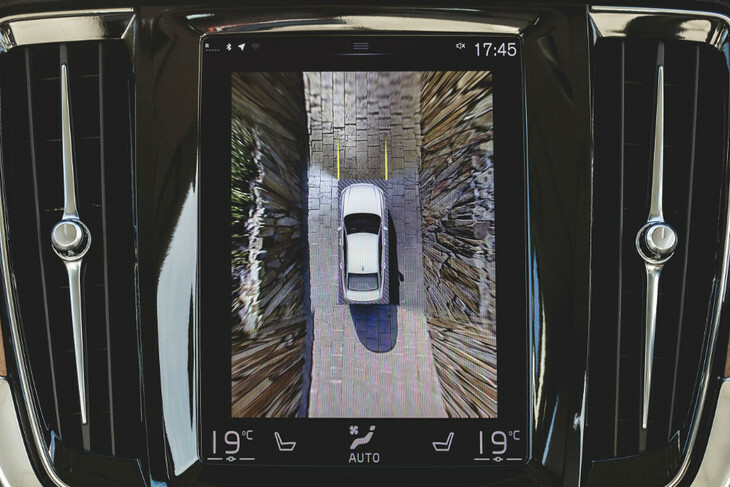 The high-resolution 360-degree view, courtesy of strategically placed cameras, make is easy to manoeuvre the Volvo into tight spaces. The rest of the safety package is comprehensive. The new Intellisafe includes City Safety to pick up errant pedestrians, cyclists and animals, run-off-road mitigation, auto braking in intersections for oncoming traffic, front collision warning with full auto brake as well as the lane-keeping aid, lane departure warning and driver alert control. The car's also able to read road signs. What this basically means that if you're not paying attention and the car thinks you're going to drive into someone, it'll alert you loudly. If you don't react in time, it'll intervene. 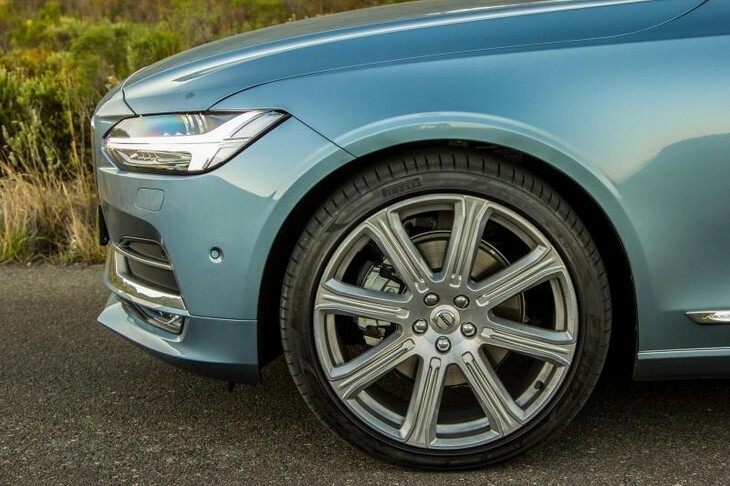 The S90's ride quality is very pliant considering its sizeable wheels and tyres. The ride/handling balance is hard to fault, actually. The S90 is all-wheel driven, but the capability has more to do with traction on wet and snowy, as opposed to gravel, roads. There aren't steering wheel paddle shifters on this car: Volvo has opted for a luxury driving experience as opposed to a sportier one. That being said, the S90 can string together a few fast bends when required and thanks to the combination of stability control and all-wheel drive, it's going to take some most unVolvo-driver-like behaviour for the car to become unsettled. Brisk, yet comfortable cruising is this car's forte. The steering arrangement is deserving of praise as it feels true and direct, but still with a focus on comfort. 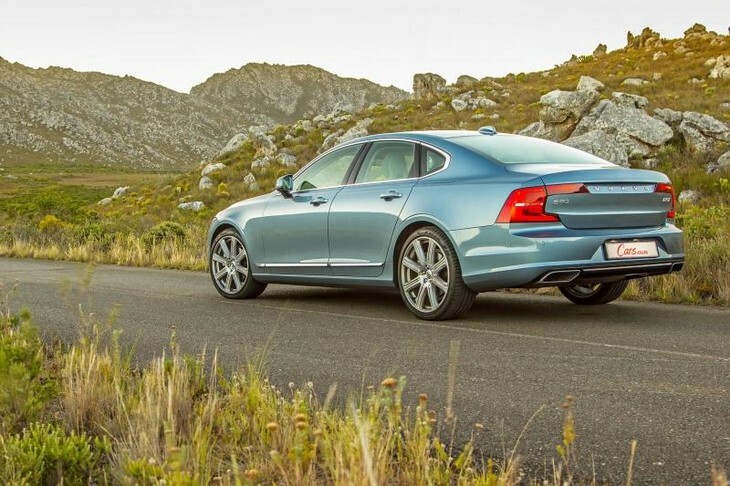 It has a fair degree of weight to it, which befits the S90's the big, luxury sedan persona to a tee. It's light enough to make low-speed tight parking manoeuvres less stressful, yet heavy enough to let you know you're at the tiller of something substantial. 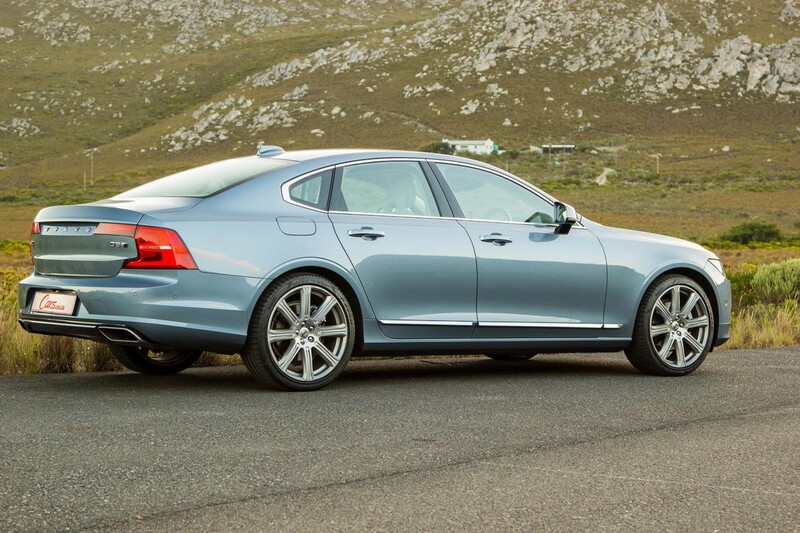 Because the S90 is Volvo's top-rung sedan, it cannot be accused of being too derivative of a first class car sibling. As this article is published in April 2017, a quick glance at the sales figures from March 2017 does not paint a pretty outlook for the S90. Just five vehicles found homes, while its XC90 SUV sibling tallied up 44 sales. See, one of our fears is that the S90 will fall victim to the SUV trend and it doesn't help matters that the XC90 is already an accomplished performer and lest we forget that the all-new Volvo XC60 is waiting in the wings. The similarities between the S90 and XC90 are much closer than you think as they're built on the same platform and share many components. To put things in context, the entire premium sedan market has taken a serious hit over the past few years and it's not just Volvo that's feeling the impact. 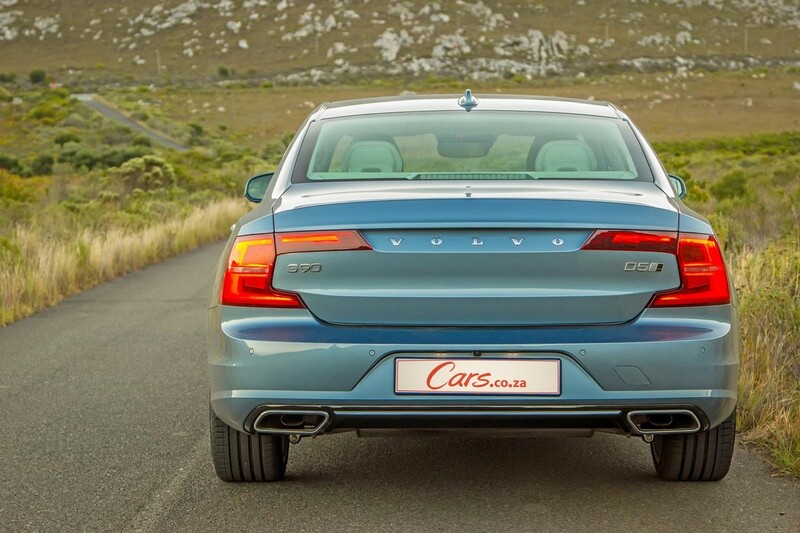 The S90 range starts from R685 206, with this D5 Inscription priced at R830 198. The price includes a 5-years/100 000 km maintenance plan as well as a 5-years/100 000 km warranty. Volvo has also come up with some attractive financing and insurance options – read more about those here. 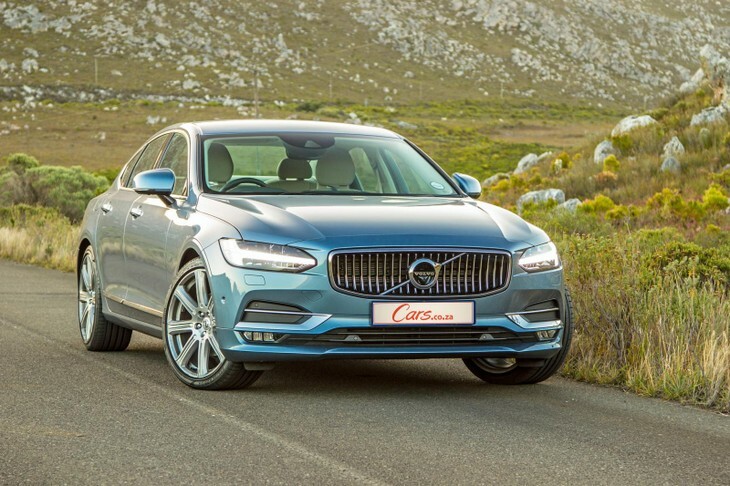 Volvo wants to improve its market footprint in South Africa, but is simultaneously determined to foster the brand's boutique appeal. It is hard to fault the latest offering from Gothenburg. It offers a stylish, luxury-car-first-and-foremost driving experience and, unlike many of its competitors, offers a fair whack of standard specification for a not-unreasonable amount of money. 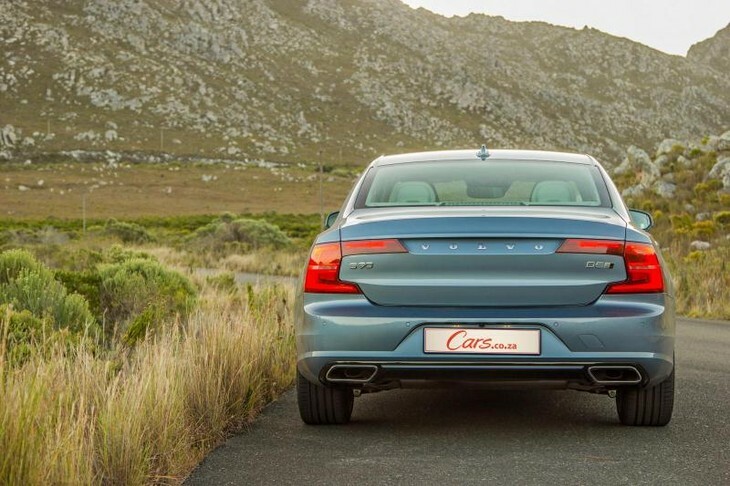 The cabin is as pretty as it is plush; the engine, while not as thrifty as hoped, is more than up to the task of hustling the S90 along – you won't miss a bigger powerplant. 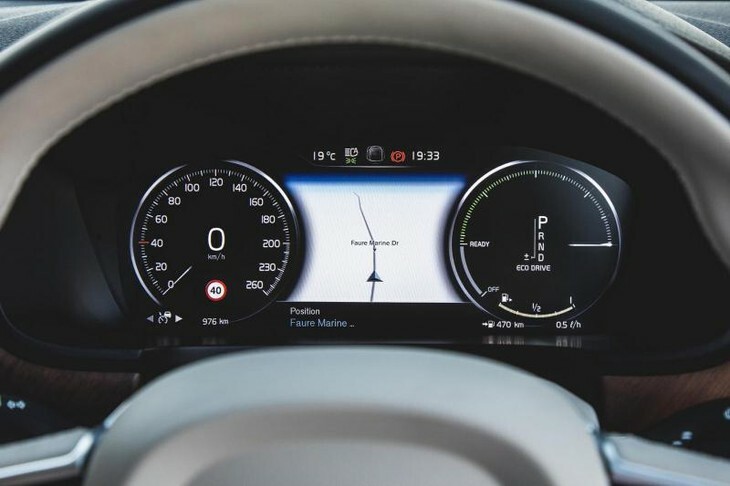 The safety features are in abundance and you're getting a glimpse of how smart a passenger vehicle has become/how close to the age of the autonomous vehicle we are. The ride and refinement get two thumbs up from us and we'd argue that this D5 Inscription pack is more competitive and desirable than its petrol-powered siblings. 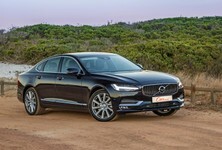 Will the S90 be a sales success? It's a great package, but the lure of an SUV in the form of an XC90 (or the forthcoming XC60) may prove to be this luxury sedan's undoing. That being said, if you're not sold on the refined but derivative Mercedes-Benz E-Class, don't care much for the sporty pretensions of the BMW 5 Series and Jaguar XF... in other words, if you want something totally different, then the Volvo S90, in this spec, makes a compelling argument. The range is competitively priced, it's comfortable and stylish, and brimming with the latest technology. Looking for a new/used Volvo S90 to buy?